We all have in-valuable and precious data we cannot afford to lose – be it the family reunion photos, school project or that career changing assignment you’re working on. Shadow Stream Pro makes sure your documents and files stay safe – and every single version of them too. When saving a document – any document, from any app that is – Shadow Stream Pro will immediately detect that new version and create an encrypted backup copy of it to a destination of your choice – be it a different folder, external drive or even your personal iCloud Drive, Dropbox, Google Drive or OneDrive. Should you ever need to recover an old, different or deleted version of your work, Shadow Stream Pro features an easy-to-use Shadow Manager that will let you browse through every single version of that important file or folder – and with a view clicks, will let you restore the exact snapshot you need. Auto-Sync encrypted shadow files to iCloud Drive, Dropbox, Google Drive or OneDrive for extra data security. Choose frequency of backups – instantaneous, or after a user-selected delay. Track changes made to your files with the Activity Monitor. Browse and safely recover any file versions with the sophisticated yet easy-to-use Shadow Manager. Also: Shadow Stream Pro is education-friendly, meaning schools get a great deal for their students for bulk orders. The Shadow Stream Manager: the perfect tool to manage and keep track of backups and versions of your files and folders. Easily select individual time frames and recover entire folder structures or individual file versions in just a few simple clicks. 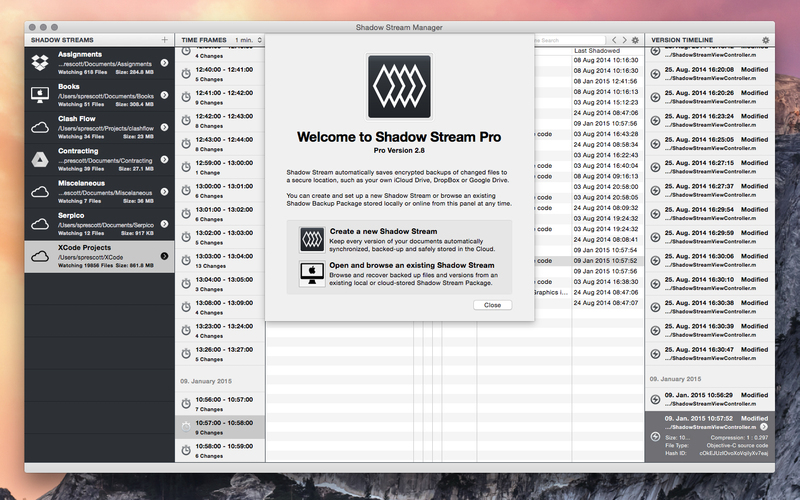 Shadow Stream Pro lets you easily manage your versions without being invasive. The small multi-functional Shadow Stream Pro app icon in the menu bar let’s you rest assured that your files are safe. 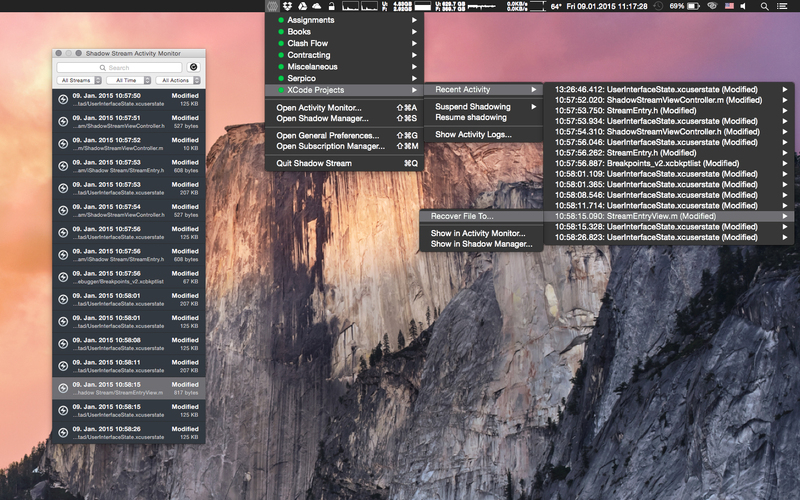 You can also open Shadow Stream Pros’s Activity Monitor to track file and folder changes in real-time. Every file or folder is monitored for changes. Shadow Stream Pro instantly detects when a file was modified or added and instantly creates a back-up of the affected files. Shadow Manager lets you browse through time frames and clearly shows you what has happened down to the second. From there you can recover entire folder structures or just that one file you need. 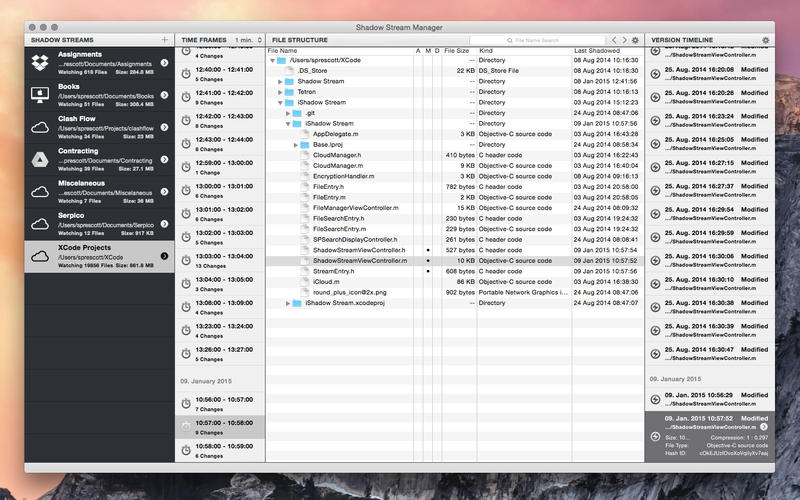 Shadow Manager has a powerful built in function that lets you search for file names throughout all time to quickly locate that version you’re looking for. Shadow Stream Pro’s Activity Monitor lets you see what changes are made to your watched folders in real-time. From there you can recover any file with just a few simple clicks. Shadow Stream Pro isn’t intrusive. With just a simple icon in the menu bar, you can access a multitude of functions to control your streams and control recent activity. Your data is encrypted with your own password with a proven AES-256 Encryption algorithm – Your data is your data and that’s the way it should be. Besides having a very low power footprint, Shadow Stream Pro features a sophisticated snooze and suspend functionality that lets you pause any syncing or backup up if you want to make some unrecorded changes to your files and documents. You can chose to have Shadow Stream Pro sync your encrypted backup files to a local drive or iCloud – great for when you’re on the road, at work or in school and want to be sure every version of your assignment is safe. Shadow Stream Pro conveniently stores your backed up files in an encrypted Shadow Package. If you want to, you can have Time Machine back up your Shadow Packages as soon as you connect to a Time Capsule. of accidentally overwriting or losing important files!